All rights reserved. FAO encourages reproduction and dissemination of material in this information product. Non-commercial uses will be authorized free of charge, upon request. Reproduction for resale or other commercial purposes, including educational purposes, may incur fees. Applications for permission to reproduce or disseminate FAO copyright materials, and all other queries concerning rights and licences, should be addressed by e-mail to copyright@fao.org or to the Chief, Publishing Policy and Support Branch, Office of Knowledge Exchange, Research and Extension, FAO, Viale delle Terme di Caracalla, 00153 Rome, Italy. FAO Fisheries and Aquaculture Technical Paper. No. 553. Rome, FAO. 2011. 181p. such as sustainability and responsible fisheries management. Their use is also becoming more common in efforts to ensure food safety, quality and environmental sustainability in the growing aquaculture industry. Private standards are now a key mechanism for large-scale retailers and commercial brand owners wishing to translate requirements – both product and process specifications – to other parts of the supply chain. This is especially important as supply chains become more vertically integrated. Indeed, from the perspective of the firm, private standards and the certification sitting behind them can serve as mechanisms for safety and quality assurance. They can also facilitate traceability, standardization of products from a range of international suppliers, and transparency of production processes. Attachment to an environmental standard or ecolabel provides retailers and brand owners with insurance against boycotts from environmental groups and negative media coverage. Moreover, it also helps them tap into and grow consumer demand for ethical products. Consequently, the fisheries procurement policies of most large retailers typically include a significant sustainability component, often with targets for wild-caught fish to be certified to an ecolabel, and for farmed fish and seafood to be certified to an aquaculture certification scheme. Suppliers working at the post-harvest level are increasingly required to be certified to a private food safety management scheme. Therefore, the onus is increasingly on suppliers to verify that their products meet certain standards. Certification provides this “burden of proof”. Although the impact of private standards is not uniform across markets, species or product types, it is likely to increase, including in developing countries, as supermarket chains consolidate their role as the primary distributors of fish and seafood products, and as their procurement policies move away from open markets towards contractual supply relationships. As the leading retail transnationals extend their global reach, their buying strategies are likely to progressively influence retail markets in East Asia, Africa, Eastern Europe and Latin America. Key issues related to the overall impact of private standards in fisheries and aquaculture and how they affect various stakeholders require resolution. The compliance costs associated with certification to a private standard represent another contentious issue. These costs are borne disproportionately by those upstream in the supply chain rather than those downstream where the demands for certification generate. However, arguably more problematic is the distribution of those costs: Is some redistribution of costs possible, and using what levers? Furthermore, the multiplicity of drivers for the traceability aspects of private standards schemes, which retailers and brand owners find most compelling, requires integration to meet the multiple requirements relating to food safety, catch certification, illegal, unreported and unregulated (IUU) fishing and the chain-of-custody aspects of private voluntary certification schemes, as well as public regulatory requirements. Most importantly, the proliferation of private standards causes confusion for many stakeholders: fishers and fish farmers trying to decide which certification scheme will maximize market returns; buyers trying to decide which standards have most credence in the market and will offer returns to reputation and risk management; and governments trying to decide where private standards fit into their food safety and resource management strategies. 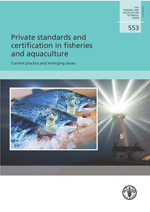 This technical paper analyses the two main types of private standards affecting fish trade, namely ecolabels and food safety and quality standards, and their importance for a range of stakeholders. It addresses issues that are driving their development and examines inter alia their policy and governance implications, their impact on costs, their role in traceability, the assessment of their credence, and the challenges and opportunities for developing countries. 6.1 How can the quality and credence of private standards and related certification be assessed?